It is fun to drive the roadster open. up to top speed on the Autobahn. If you like to have more air breeze around your nose, it is easily adjustable with the height of the side windows. 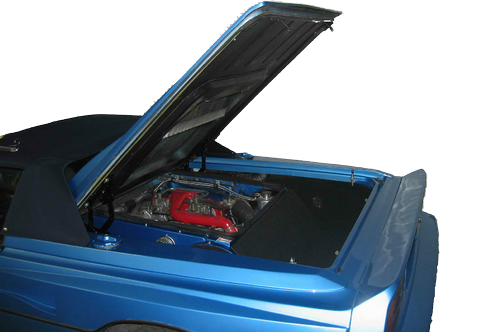 The hard top can be fitted quickly and stows on sunny days in the rear boot. The reinforcements developed with the conversion adds enough rigidity, so the drive is as enjoyable as in the coupe version. The so called “St Tropez” convertible conversion was designed and realized from Paul Bailey. With the background of 15 years in design and manufacturing as an employee of an engineering company which modified Mercedes, Range Rovers and Rolls Royce's, he gained a lot of experience in car customizing. His 1987 established company PBB Design did as well some 10 Jaguar XJS upgrades during the 90´s known as “Monaco” and other modification work for ambitious customers. 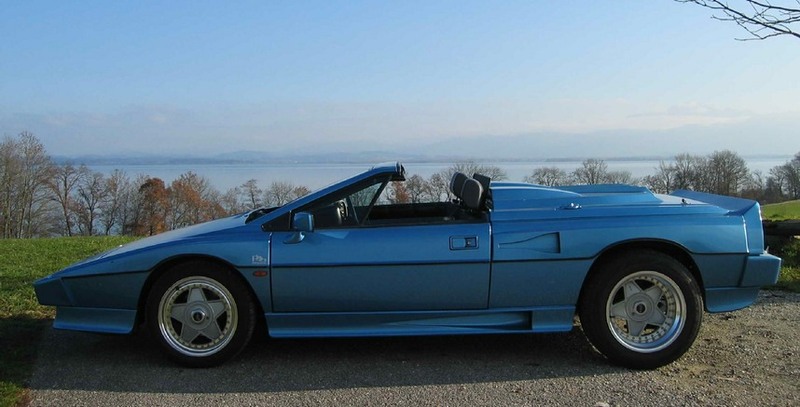 The St Tropez roadsters are based on the series S2 and S3 Giugiaro Esprit's only. The first three conversions were executed by Paul Bailey and his young company PBB Design. based in Bristol, Pilning at that time. No.  1 “The White” (1989) and No. 2 “The Blue” (1990) were for sure no customer jobs. 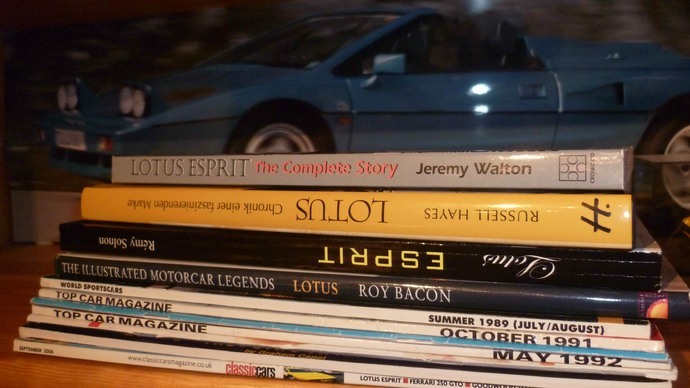 PBB had to verify with performed conversions, that the finished cabriolet will be still an Esprit to drive with. 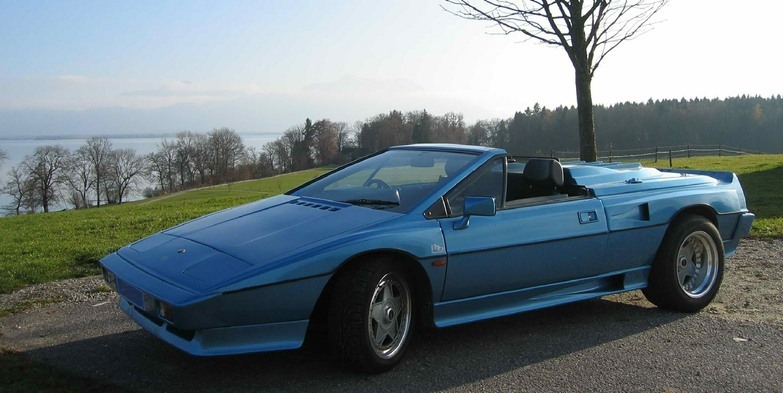 As the second Esprit roadster was even more a strong Turbo model, which proofed that the cabriolet had still a refined road handling, the first customer chop job arrived soon after as No. 3 “The Yellow” (1991), a S2 model with a Rover V8 under the bonnet. The latter ones were claimed to be finished by Esprit Developments, as Mark Irwin had taken over the moulds, drawings and rights for the St Tropez conversion from PPB after his own “The Yellow” St Tropez No. 3 was finished. I had seen Paul Baileys second blue St Tropez in a couple of Esprit books and always found the look to be a real vision. I esteem him for realizing his dream of a convertible Esprit. The design is not perfect from every angle on the pictures, but the overall appearance is amazing when you see the roadster outside in the sun. Chopping of the roof behind the windscreen and the C buttresses of the rear upper body including removal of the tailgate was the first action. The now missing parts were replaced with new body panels made out of glass fiber resin compound. Mouldings were manufactured up front and gave the new parts a perfect surface finish. The new tailgate is a stiff bonnet with an internal sub frame for strengthening.  Opening is supported with a mechanical spring supported scissor device. The front and rear wheel arches were widened to give the car a more beefy appearance. Some of the cars stayed with original wheels, others got Compomotive three-piece alloy wheels with extended rim size in diameter and width. The better filling of the wheel arches with the bigger rubber suited the broadened wings very well. 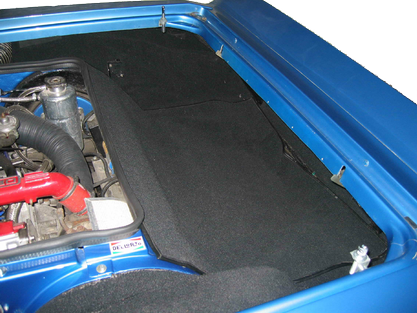 To accommodate the newly developed hard top / soft top combination with foldable pillars in the rear boot behind the engine, the boot compartment was modified partly with new center panels. Now the removable roof slides in quite comfortable and is a snug fit in there. As the body is now missing the C buttresses, the rear chassis got a triangulated extension which supports the body in the aft section. At the front, the A posts around the windscreen were strengthened with mild steel tubing. Additionally, inside the lower sills runs now a twin tube steel bracing on each side which prevents the chassis from twisting. To support the engine bay venting through the sills, Naca air intakes near the seam line on either side were added. The left one supports venting for additional engine bay cooling like introduced from Lotus for the hc Esprit's in 1986 on the exhaust side. The right Naca duct feeds the two twin carburetors with ram air. 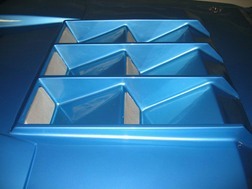 The hot engine bay air escapes through the six large vents in the middle of the bonnet. As this sums up to an awful lot of labour and parts involved, the basic conversion without new wheels was already quite pricey even for the early 1990´s with a price tag of 4500 £ including a full respray.